Holy Week begins on Sunday, April 14th – Palm Sunday. On the April 14, 2019 edition of Catholic Forum, tune in to hear the annual presentation of the Passion of Christ Gospel by the Saint Elizabeth High School drama class. Catholic Forum is a production of the Office of Communications of the Diocese of Wilmington. Listen Sunday mornings at 6:06 on WDEL 1150AM and 101.7FM in Wilmington or wdel.com. After the program airs on broadcast radio, it is available via podcast (click the link), or by searching Catholic Forum on Apple, iHeartRadio, and Spotify Podcasts. Click here for more info. Bishop Malooly will lead Good Friday Stations of the Cross at Cathedral Cemetery on April 19th. Click here for details. May another Mass besides the Mass of the Lord’s Supper be celebrated on Holy Thursday? How are the Holy Oils, consecrated and blessed at the Chrism Mass, to be received in the parish? A reception of the oils may take place before the Mass of the Lord’s Supper. The oils, in suitable vessels, can be carried in procession by members of the assembly. Go to the Order for the Reception of the Holy Oils page for more information. Is the Mandatum, the washing of feet at the Mass of the Lord’s Supper, required? When should the Good Friday Celebration of the Lord’s Passion take place? Normally it should take place in the afternoon, at about 3:00 PM, to enable people to assemble more easily. However, pastoral discretion may indicate a time shortly after midday, or in the late evening, though never later than 9:00 PM. Depending on the size or nature of a parish or other community, the local Ordinary may permit the service to be repeated. May a deacon officiate at the Celebration of the Lord’s Passion? Although the Celebration of the Lord’s Passion appears to be a service of the Word with the distribution of Holy Communion, the Roman Missal does not permit a deacon to officiate at the celebration. Historically, even though the Eucharist is not celebrated on this day, the liturgy of Good Friday bears resemblance to a Mass. At one time it was called the “Mass of the Presanctified” (referring to the pre-consecrated hosts used at Communion, even when only the priest received Communion). This is also reflected in the prescribed vesture for the priest: stole and chasuble. The liturgy of Good Friday, as an integral part of the Triduum, is linked to the Holy Thursday Mass of the Lord’s Supper and the Easter Vigil on Holy Saturday. While there may be cases where a parish with multiple churches or chapels (e.g., mission churches or a cluster of parishes under one pastor) might rotate the liturgies among the various locations, it would not be appropriate for a community to celebrate only part of the Triduum. May any of the readings at the Celebration of the Lord’s Passion be omitted? The Lectionary for Mass does not indicate that any readings may be omitted at the Celebration of the Lord’s Passion. All three readings (Isaiah, Hebrews, and the Passion according to John) are required. It should be noted, however, for Palm Sunday of the Lord’s Passion, the Lectionary indicates that while all three readings provided should be used, there may be circumstances in which one or more of the readings at Mass could be omitted: “Given, however, the importance of the account of the Lord’s Passion, the priest, having in mind the character of each individual congregation, is authorized to choose only one of the two readings prescribed before the Gospel, or if necessary, he may read only the account of the Passion, even in the shorter form. This permission applies, however, only to Masses celebrated with a congregation.” Thus, the account of the Passion is never omitted. Does the Church encourage any other liturgical celebrations on Good Friday? On this day the Office of Readings and Morning Prayer could appropriately be celebrated with the participation of the people in the churches. Note that Evening Prayer is only prayed by those who do not participate in the Celebration of the Lord’s Passion. Do devotions have a particular importance on Good Friday? The Directory on Popular Piety and the Liturgy (2002) provides the proper perspective in paragraphs 142-145. Clearly the central celebration of this day is the Good Friday Celebration of the Lord’s Passion. In no way should manifestations of popular piety, either by the time or manner in which they are convoked, substitute for this solemn liturgical action. Nor should aspects of the various acts of piety be mixed with the Good Friday celebration, creating a hybrid. In recent times, Passion processions, celebrations of the Stations of the Cross, and Passion Plays have become more common. In such representations, actors and spectators can be involved in a moment of faith and genuine piety. Care should be taken, however, to point out to the faithful that a Passion Play is a representation which is commemorative and they are very different from “liturgical actions” which are anamnesis, or the mysterious presence of the redemptive event of the Passion. How does the Adoration of the Holy Cross on Good Friday begin? The Adoration of the Holy Cross begins with one of two forms of the Showing of the Holy Cross. The First Form begins as the deacon or another suitable minister goes to the sacristy and obtains the veiled Cross. Accompanied by two ministers with lighted candles, the veiled Cross is brought to the center of the sanctuary in procession. The priest accepts the Cross and then, standing in front of the altar and facing the people, uncovers the upper part of the Cross, the right arm, and then the entire Cross. Each time he unveils a part of the Cross, he sings the acclamation, Behold the wood of the Cross. In the Second Form of the Showing of the Holy Cross, the priest or deacon goes to the church door, where he takes up the uncovered Cross. Accompanied by two ministers with lighted candles, he processes to the sanctuary, stopping at the door of the church, in the middle of the church, and before entering the sanctuary, to sing the acclamation, Behold the wood of the Cross. How is the cross venerated by members of the congregation on Good Friday? After the showing of the Cross, the priest or deacon may carry the Cross to the entrance of the sanctuary or another suitable place. The first person to adore the Cross is the priest celebrant. If circumstances suggest, he takes off his chasuble and his shoes. The clergy, lay ministers and the faithful then approach the Cross. The personal adoration of the Cross is an important feature in this celebration and every effort should be made to achieve it. The rubrics remind us that “only one Cross” should be used for adoration. If the numbers are so great that all cannot come forward, the priest, after some of the clergy and faithful have adored the Cross, can take it and stand in the center before the altar. In a few words he invites the people to adore the Cross. He then elevates the Cross higher for a brief period of time while the faithful adore it in silence. It should also be kept in mind that when a sufficiently large Cross is used even a large community can reverence it in due time. The foot of the Cross as well as the right and left arm can be approached and venerated. Coordination with ushers and planning the flow of people beforehand can allow for this part of the liturgy to be celebrated with decorum and devotion. The Vigil, by its very nature, must take place at night. It is not begun before nightfall and should end before daybreak on Easter Sunday. The celebration of the Easter Vigil takes the place of the Office of Readings of Easter Sunday. The Easter Vigil begins and ends in darkness. It is a nocturnal vigil, retaining its ancient character of vigilance and expectation, as the Christian people await the Resurrection of the Lord during the night. Fire is blessed and the paschal candle is lighted to illumine the night so that all may hear the Easter proclamation and listen to the word of God proclaimed in the Scriptures. For this reason the Solemn Beginning of the Vigil (Lucernarium) takes place before the Liturgy of the Word. Since sunset varies at different locations throughout the country, local weather stations can be consulted as to the time of sunset in the area, keeping in mind that twilight concludes (i.e., nightfall occurs) somewhat later. What considerations should be given for the paschal candle used at the Easter Vigil? This candle should be made of wax, never be artificial, be replaced each year, be only one in number, and be of sufficiently large size that it may convey the truth that Christ is the light of the world. The paschal candle is the symbol of the light of Christ, rising in glory, scattering the darkness of our hearts and minds. Above all, the paschal candle should be a genuine candle, the pre-eminent symbol of the light of Christ. Choice of size, design, and color should be made in relationship to the sanctuary in which it will be placed. In the case of mission churches and cluster parishes, can multiple paschal candles be used for the Service of Light? The Roman Missal, not envisioning the pastoral situation of mission churches or cluster parishes, specifies that only one paschal candle is used. To accommodate the particular circumstances, the Secretariat of Divine Worship might suggest that the candles from the mission churches or other parish churches could be present at the Easter Vigil, having been prepared in advance, and blessed alongside the main candle (perhaps having deacons or other representatives holding them). In keeping with the rubrics, for the lighting and procession only one candle should be lit (the principal one, or the one which will remain in that particular church). As the other candles in the congregation are lit, the other paschal candles could be lit and held(but not high, in order to maintain the prominence of the one principal candle) by someone at their place in the assembly. Once all the candles are extinguished after the singing of the Exsultet, the other paschal candles are put aside. On Easter Sunday morning, those candles could be taken to each of the missions and carried, lit, in the entrance procession at the first Mass at each church and put in place in the sanctuary. How many readings should be proclaimed at the Easter Vigil? One of the unique aspects of the Easter Vigil is the recounting of the outstanding deeds of the history of salvation. These deeds are related in seven readings from the Old Testament chosen from the law and the prophets and two readings from the New Testament, namely from the Apostle Paul and from the Gospel. Thus, the Lord meets us once again on our journey and, “beginning with Moses and all the prophets” (Lk 24:27) opens up our minds and hearts, preparing us to share in the breaking of the bread and the drinking of the cup. The faithful are encouraged to meditate on these readings by the singing of a responsorial psalm, followed by a silent pause, and then by the celebrant’s prayer. Meditation on these readings is so significant for this night that we are strongly urged to use all the readings whenever it can be done. Only in the case of grave pastoral circumstances can the number of readings be reduced. In such cases, at least three readings from the Old Testament should be read, always including Exodus 14. How is the First Communion of the neophytes to be emphasized during the Easter Vigil? The celebrant, before he says, Behold the Lamb of God, may make a brief remark to the neophytes about their first Communion and about the importance of so great a mystery, which is the climax of initiation and the center of the Christian life. This is a night when all should be able to receive Holy Communion under both forms. What directions are given for the celebration of Masses on Easter Sunday? Mass is to be celebrated on Easter Day with great solemnity. A full complement of ministers and the use of liturgical music should be evident in all celebrations. On Easter Sunday in the dioceses of the United States, the rite of the renewal of baptismal promises may take place after the homily, followed by the sprinkling with water blessed at the Vigil, during which the antiphon Vidi aquam, or some other song of baptismal character should be sung. (If the renewal of baptismal promises does not occur, then the Creed is said. The Roman Missal notes that the Apostles’ Creed, “the baptismal Symbol of the Roman Church,” might be appropriately used during Easter Time.) The holy water fonts at the entrance to the church should also be filled with the same water. On the subsequent Sundays of Easter, it is appropriate that the Rite for the Blessing and Sprinkling of Water take the place of the Penitential Act. Where is the paschal candle placed during Easter Time? The paschal candle has its proper place either by the ambo or by the altar and should be lit at least in all the more solemn liturgical celebrations of the season until Pentecost Sunday, whether at Mass, or at Morning and Evening Prayer. After Easter Time the candle should be kept with honor in the baptistery, so that in the celebration of Baptism the candles of the baptized may be lit from it. In the celebration of funerals the paschal candle should be placed near the coffin to indicate Christ’s undying presence, his victory over sin and death, and the promise of sharing in Christ’s victory by virtue of being part of the Body of Christ (see Order of Christian Funerals, no. 35). The paschal candle should not otherwise be lit nor placed in the sanctuary outside Easter Time. 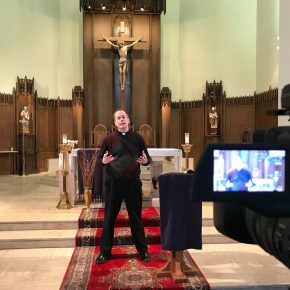 You are invited to attend a multimedia Lent series titles, “Holy Boldness: A Journey Through Lent with Four American Saints,” distributed via digital video, radio broadcasts, and podcasts. Written and hosted by the Reverend Richard J. Jasper, Associate Pastor of Saint Ann Church in Wilmington, Delaware, the series is designed to help individuals and families get the most out of the Season of Lent and prepare spiritually for the celebration of Christ’s resurrection at Easter. Please subscribe to and like the videos on the Diocesan YouTube channel at www.YouTube.com/DioceseofWilm . The audio portion of the presentation is also available on the Catholic Forum” podcast at cdow.org/Catholic-Forum and on Apple, Spotify, and iHeartRadio podcasts. Additional free Lent resources will be found here, on this web page. Bishop Malooly to lead Good Friday Stations of the Cross at Cathedral Cemetery on April 19th. Click here for details. The summit of the Liturgical Year is the Easter Triduum—from the evening of Holy Thursday to the evening of Easter Sunday. Though chronologically three days, they are liturgically one day unfolding for us the unity of Christ’s Paschal Mystery. Click here for more from the USCCB. Not Just Another Lent! A reflection from Very Rev. Lewis Fiorelli, OSFS. Click here. For a Lenten Calendar and other resources from the USCCB, click here. For Catholic Apostolate Center resources, click here. EWTN has Lenten resources, too. Find them here. Click here for Bishop Robert Barron’s Word on Fire Lenten resources.